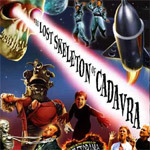 The Lost Skeleton of Cadavra is the perfect show for an outdoor movie. It’s campy, bad, and fun. It recreates, to a degree, the science fiction serials of yesteryear, where scientists “do science” with microscopes and aliens happen to speak a version of English. Unfortunately, “bad” isn’t always good. Space aliens! Rocket ships! Death rays! The Lost Skeleton of Cadavra! The movie gets off to a great start, with a short feature from the 1930s — a cartoon by Ub Iwerks who had worked for Disney before setting off on his own. The movie itself is shot on video and presented in black and white, in an aspect ratio than didn’t exist until the last decade or so. It’s indicative of the schizophrenia that keeps Lost Skeleton from being as good as it might have been. The story involves three couples and their pursuit of the element known as “atmospherium.” Dr. Paul Armstrong (director Larry Blamire), the scientist, and his wife Betty (Fay Masterson) head out into the woods, where Dr. Armstrong hopes to find some atmospherium so he can do science on it. Dr. Fleming (Brian Howe) and Animala (Jennifer Blaire), the girl he creates from woodland creatures, hope to steal the atmospherium to re-animate the titular skeleton lord. Finally, the Marvan aliens (i.e., from the planet Marva), Kro-Bar and Lattis (Andrew Parks and Susan McConnell) hope to use the atmospherium to repair their spaceship and return home. There’s nothing wrong with the plot. It’s something I could imagine seeing in a matinee 50 years ago. I could even imagine both appreciating it and being able to make fun of it at the same time. The trouble with Lost Skeleton is that it tries too hard to be bad and campy. And while there are some funny, silly moments that break through, most of the movie gets lost amid the nodding and winking. Campy serials were made on a shoestring budget; they weren’t bad on purpose, and that was half the fun. Ironically, I might also say that the movie doesn’t try hard enough. Since the filmmakers try to match the style of old sci-fi movies — by shooting in black and white and using deliberately bad special effects — they should have gone all out. Period haircuts for all of the principal actors would have helped sell the ’50s feel. Shooting with only a fixed lens and no closeups would have kept the visual style out of the era of TV. The one aspect that Lost Skeleton unquestionably gets right is the grand, dramatic, monaural music, which is apparently assembled from genuine movie music from the period. It just goes to show that even for really bad movies, the originals were better than the remakes.